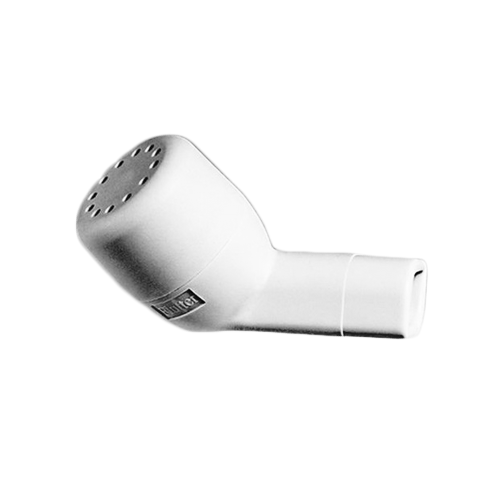 Flutter Valve device is used for Breathing Therapy by helping patients dislodge mucus and other secretions from the airways. The Flutter mucus clearance device is highly portable and easy to use. This Flutter Valve is also known as the Acapella Flutter Valve because of its three action mechanisms. First, the Flutter device aides in the removal of mucus and other secretions. Second, the Flutter valve provides a positive expiratory pressure (PEP), which helps hold airways open. Third and last is airway oscillation. Flutter valve therapy helps vibrate mucus away from airway walls and produces an intermittent acceleration flow. This acceleration helps push mucus upward for expectoration; thereby, clearing the air passage ways. The Cough Assist Flutter device is shaped like a pipe and has a hardened plastic mouthpiece at one end, a perforated plastic cover at the other end and a stainless steel ball resting in a plastic circular cone on the inside. The Flutter Mucus Device serves patients with chronic obstructive pulmonary disease (COPD) such as asthma, atelectasis, bronchitis, brochiectasis, cystic fibrosis, or other conditions producing retained secretions. The Flutter mucus clearing device operates by having the patient blow into the mouthpiece. The vibrations caused by intermittent air flow though the flutter chamber loosens mucus and secretions for the patient. This positive expiratory pressure helps the patient expel mucus and phlegm. The flutter action is caused by the vibrating steel ball within the flutter chamber, causing a non-invasive airway oscillation. The Flutter mucus clearance device can be used by any age. Its small size and weight allows the patient to take it with them where ever they go. How do I clean this device? The manufacturer suggests opening the valve and washing with soap, water and a soft bristle brush. is this product available at a store on Edmonton, Alberta or only online? We do not have any retail stores in Canada. We can have this item internationally shipped through our international checkout feature. How many times a day can you use the flutter? Why can't you buy them in local pharmacy? Flutter usage is dependent on a case-by-case basis and some may require a prescription based on State laws. We recommend contacting your doctor for proper usage of a flutter valve. You will be able to purchase this valve without a prescription. Bogus Item..............hokus pokus medicine in my book, and Can't return! Easy to use. Brings up mucous. Easy to clean. I use this myself and am also an MD. Highly recommend. 2 months after ordering I had to call them, because they never contacted me. After waiting 2 months I call this company to see where my valve is. They tell me it's on back order. Why wasn't I told this? "I'm sorry sir, would you like to cancel your order?" Yes I would. She never canceled it. I called again 3 weeks later, and was told that it hadn't been canceled, again she would cancel it. She never did. I have to contest the charge now with my credit card company. Terrible company that only cares about their money, and not their customers. Ordered months ago, finally came. Great product that is often specifically ordered by physicians. Only problem, back order with manufacturer. I was supposed to get my flutter valve in 5-8 days. I ordered it on nov 9, I got a e-mail stating it would not be available until Dec 16. I called to check my order status and the recording says I have one person ahead of me ever day from 30 minutes to an hour I've held the phone and no answer. what is my order status?????? Very good product. Works very well. Good product. It certainly works as advertised. I was skeptical when I first got it and was reluctant to try it because of some of the warnings and my particular shortness of breath problem. But I did try it and am happy I did. Thank you for your help in guiding me to this particular device. for me, this flutter valve, though so simple, is one of the best adjuncts for airway clearance I have found in my entire lifetime. Used properly, this works very well for me, to clear secretions that I cannot clear just by coughing on my own. I can see that this is of some help, but it is very hard to learn to use properly. Not sure I see the value for the cost.